Today’s guest post is the second in a series of interviews by Greg Elias on The Art of Speed. With a Flash resume spanning a presidential election, trips to Hell, living clothes and a cosmic death-race, Paul Ryan’s work on the title is some of the most diverse of any artist to ever pencil those pages. Starting with issue 119, a crossover with the Final Night mini-series, Ryan was paired with Flash scribe Mark Waid. From the Presidential Race storyline through Hell to Pay, Ryan was present for the return of The Top, Wally’s temporary relocation to Santa Marta and the raging comeback of the undead Rogues. When Waid took a break from Flash in 1997, well-known writers Grant Morrison and Mark Millar took over for a year’s worth of stories. The tone of the book changed with the reintroduction of temporal challenges, mystical concepts and sci-fi elements reminiscent of the Silver Age Flash, as well as the expansion of more recent tropes like the Speed Force and Wally’s childhood. Ryan also illustrated Legends of the DC Universe: Crisis on Infinite Earths, by Crisis architect Marv Wolfman, which tells the story of Barry Allen’s time on Earth D.
Previously an artist over at Marvel Comics, Ryan co-created the New Universe series DP7 and spent a notable, lengthy run on Fantastic Four. Most recently, he has illustrated The Phantom comic strip. Recently collected for the first time, Emergency Stop and The Human Race showcase much of the second half of Ryan’s run on Flash. Ryan answered our questions via email, revealing some of the process and his favorite Flash. Q: You got one of the first cracks at the classic Rogues Gallery during a time when they were not used as frequently (outside of Waid’s Underworld Unleashed). Did any previous Flash vs. Rogues stories or issues in particular come to mind when you started to work on those scenes? 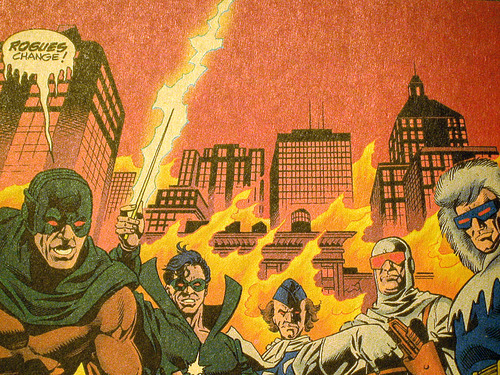 Also, what was it like having the one of the first chances to portray the Rogues as the ruthless, murdering type? Even though they were under the control of outside forces during that story, a “measured” amount of violence and murder has since become the norm for these characters. PR: I remembered many of the stories illustrated by Carmine Infantino that featured those wonderful villains. I had those comics (until my Mother gave them away…I forgive you, Mom) and loved them all. I can’t say that I thought of any specific issue when I was working on the Underworld storyline. It was more like an overall sense of nostalgia. It was cool to be playing in the same sandbox as Carmine Infantino. My wife, Linda, and I met him a few years ago at a Boston Con. What a nice gentleman. The Rogues were gentlemen thieves in the sixties. Transforming them into ruthless killers was not comfortable for me but we were dealing with a new time and place. A grittier, harsher world that the readers seemed drawn (no pun intended) to. 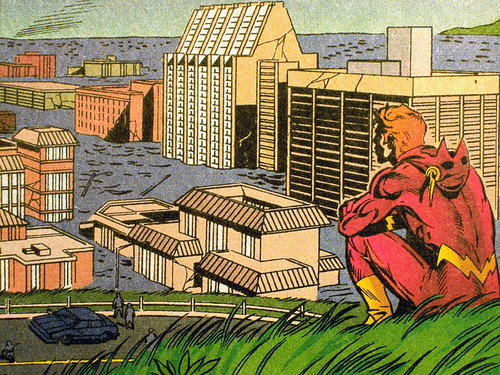 Q: When Wally West was still living in Keystone but “working” in Santa Marta, you were portraying a Midwestern city and a Pacific coast one at the same time, sometimes on the same page. What went into making the locales appear different, and what was it like executing the siege of both at the beginning of Hell to Pay? PR: Ah, yes, the Santa Marta storyline. I had plenty of reference on California from my trips to ComiCon. The Keystone reference was already available from previous issues. An interesting thing about Wally’s house in Santa Marta. Around the time when I had to design the house, I had a visit from a British fellow, Simon Powell, who wished to purchase some of my artwork. We had already established a relationship that started on eBay and I had told him that whenever he was in the New England area he was welcome to stop by and go through my stacks of originals. During his visit he mentioned that he was moving to Grand Cayman. He showed me a photo of the house he had just purchased. It was the perfect house for Wally. 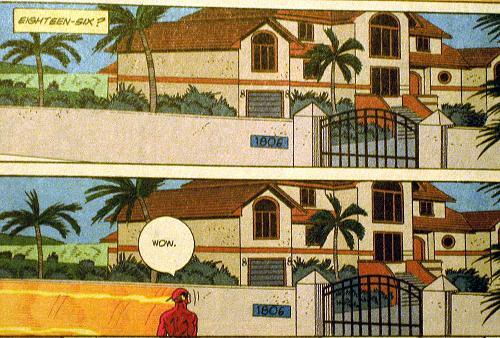 I asked Simon if I could use the image of his new house in The Flash. With a laugh and a grin Simon gave me the photo reference and bingo Wally had a home in Santa Marta. There was one scene where Wally had to save someone from a wheat harvesting combine. I took that reference from Superman III. Q: In the first issue of Emergency Stop, #130, the story centers around a time travel mystery and Flash’s solution to his own apparent death in the future. In issue #133, the Mirror Master story features a prism-trap resulting in a rainbow-Flash team, as well as Flash sorting out the bizarre effects of the mirror world. When it comes to portraying non-linear super-heroics and Flash’s interaction with theoretical environments, what are some of the biggest challenges? PAUL RYAN: If the writer does his job then I can “see” his vision in my mind. I simply put that image down on paper. Sometimes, with Grant, the stories were a little confusing but I muddled through as best as I could. Flash #130 was just such a script. I had to redraw several pages because I assumed that Wally was going to end up in the alley as we saw him at the beginning of the story. I thought the script read that way. NOPE! For some strange, paradoxical, reason known only to people of Scottish descent, Wally ended up in someone’s suburban backyard. With regard to the Mirror World storyline, some backgrounds had to be redrawn. Not because I didn’t read (“see”) the images right. Grant decided to rewrite a section of the story after I had completed all the pages, in pencil, passed them in and was working on the next issue. It was not the best working relationship of my career. Q: Your work ranged from some more street-level stories early on in the Santa Marta arc, to a confrontation with Hell, to the Silver Age John Broome tribute of the battle with The Suit, and finally Flash racing his imaginary friend across the universe. 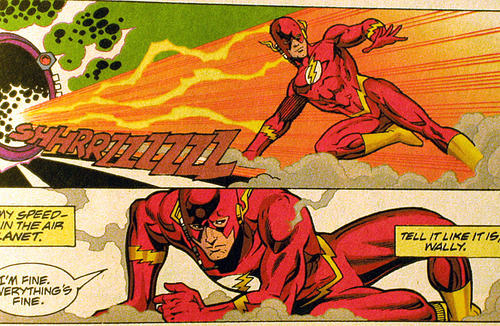 Flash’s powers and their implications lead to a number of story possibilities. What was your favorite to illustrate: the more extreme sci-fi or the urban, or somewhere in-between? PR: I have been a fan of Science Fiction for many years so I like to illustrate that type of story. I got a feel for drawing the real world from my time on DP7 at Marvel. I like to draw those stories as well. I think putting a superhero in a real world environment works really well. We get a contrast, that we can relate to on just how impressive the hero can be. Q: Can you talk about some of the differences in working with Mark Waid vs. Grant Morrison & Mark Millar? These are big names in comics, but the styles seem very different and Waid in particular had been working on the title for some time when you were working on Flash. Was the transition between teams difficult? PR: I really enjoyed working with Mark. He asked Paul Kupperberg (Flash editor) to offer me the penciling gig on the Flash. Mark did some very good people stories. No matter how cosmic the villain or catastrophic the disaster it all came down to the human experience. He, especially, did some very touching stories about Wally and Linda. And he always turned his scripts in on time. When Mark left on a one year sabbatical from the Flash he asked that I stick around until he got back. That didn’t work out. As I have stated Grant’s stories and work habits were a bit stressful to this storyteller. I never met him. We never corresponded in any form. Everything went through Paul Kupperberg. Rumor had it that Grant wanted me replaced right from the start. Kupperberg eventually did replace me and put Pop Mhan in as penciler. He asked that I stay on as inker because “The new guy needs help!” I walked. I think Pop lasted six issues. I have no idea why he left so quickly. Q: Were you involved in the design of the Speed Force suit Wally creates during Emergency Stop, and the uniforms of the Justice Alliance from Earth D in the Crisis: the Untold Story one-shot? If so, what goes into creating a familiar-but-new look for such recognizable characters? PR: Grant submitted a design for Wally’s speed force costume. It involved a helmet like Jay Garrick wore. It had the scientific symbol for Mercury (the element) on his chest. Visually it didn’t work very well. So I made up my own. I used the goggles to protect his eyes (like Impulse’s costume). The lightning symbols, on chest, forearms and calves, was indicated through use of shadows and I tried to make it as sleek as possible. No air drag. I designed all the alternate costumes for the Crisis special. It’s been quite a few years since I drew that special. I don’t remember all the reasons for my designs. Aquaman’s design borrowed a little from the Silver Age and the Bronze age with a little Marina from the Avengers/Alpha Flight. Wonder Woman was pretty much the Alex Ross look. I imagined Green Arrow as a Native American. I seem to remember giving the Atom a sturdier costume with a helmet. I figured a six inch tall guy needs more protection than spandex. I did the same for Scott Lang (AntMan) at Marvel. Little guys need armor. Lots of armor!! Q: You mentioned the human experience and Mark Waid’s ability to maintain that no matter the storyline. As a reader, this was always the reason why Wally was such an engaging character: so many of the best stories are founded in his relationships. If something reaches you personally in a script, how does that affect your work? PR: If there is something in a script that touches me in a personal way, the assignment becomes more than an exercise in layout, form and shadow. With most scripts I can “see” the scenes in my head as I read the story. It’s just a matter of getting that down quickly in a thumbnail sketch. When a story touches me, I can feel the emotions of the characters. I felt that with Mark Waid’s scripts that dealt with Wally and Linda’s relationship. I experienced it, most recently, on The Phantom. Tony DePaul and I have been working on a multi script story arc dealing with the “death” of Diana Palmer Walker, the Phantom’s wife. Chatu, The Python, orchestrates the bombing of a UN building in Mawitaan. Many people die. All believe that Diana was one of them. The Phantom mourns her death and does a lot of soul searching about his role as Bangalla’s protector. Meanwhile we learn that Diana was spirited away before the blast and was taken to a prison in the rogue state of Rhodia. Diana suffers physically. The Phantom suffers emotionally. Finally, after months of traveling and fighting terrorists, he discovers she is alive and he breaks her out of prison. The moment when they finally meet again really touched me. I guess it must have shown in the art that day. Readers have told me that it really moved them. PR: The windmill arm trick. I would add the vibrating through a wall trick but Wally seemed to have a problem with that one. Barry was my favorite Flash. He could do it all. This entry was posted in Creators, Flash History, Interviews and tagged Emergency Stop, Guest Posts, Interview, Paul Ryan, The Human Race, Wally West on December 30, 2010 by Greg Elias. sweet! I love Paul Ryan on the Flash. Met him a few times and he even signed some of the Flash stuff he did. Loved it. Great guy!! Thanks for posting the interview. Very interesting interview, I enjoyed it. Glad at least one creator had some qualms about darkening the Rogues so much. Oh, I did so enjoy that read. That period was one of my favorites: where both story *and* artwork were equally appealing. That picture with Wally looking out over the destruction of Santa Marta is still one of my top 10 faves. Great stuff. *sigh* I do miss the ‘gentlemen thieves’ though. Gritty does not appeal nearly as well. I loved his work on Flash and I was sad to see him go. I was even sadder when I opened the cover to Pop Mhan’s first issue. UGH. There are pages there that I STILL have trouble following. Went back and checked some issues and…100% agree with you. I hate the pouty-lips, distorted features of those issues as much as I hate ‘chunky’ Popeye The Speed-Force Man as Wally…or Hispanic Wally… Must go back and re- tak-in the California story arc goodness.